I read this article and found it very interesting, thought it might be something for you. The article is called Moisturising Antioxidant Face Scrub and is located at https://homemademasks.net/homemade-face-scrubs/facial-scrub-with-cornmeal-honey-and-yogurt/. This is a great Scrub if you just need to give some moisture while also cleaning your pores. It can be suitable for a few types of complexions: dry, mature, normal and combination. When thinking about a Scrub, “moisture” would probably not qualify in one of the things that a Scrub can offer you. Besides being a healthy treat, yogurt can also provide numerous benefits for your skin. Plain yogurt or whole-milk yoghurt contains lactic acid which softens the skin. However there are a multitude of advantages when using yogurt in beauty treatments. It also reduces wrinkles and hydrates dry areas, soothes sunburned skin by reducing blistering and peeling. Honey, has also an important role in this case as it helps the skin relax by locally regulating blood circulation. 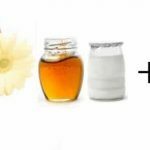 There are a lot of nutritional qualities in honey that heal and moisturize. Honey has a high content of vitamins: B1, B2, B5, B3, A, C, D and K.
It also contains organic acids, mineral salts, potassium, magnesium, phosphorus, calcium and sodium that makes it a good tranquilizer, healing, tonic and antioxidant. If you wish to give your skin some moisture while cleaning it through a facial scrub, then you should add some yogurt. Apply your scrub on your face and neck. Gently massage the entire area, without rinsing it immediately after, but leave it for 5 more minutes. You can apply this facial scrub once a week.